combination of hot pink and forest green. Sleepaway camp is one of those rare experiences that completely lets you know where you stand in life. You are somewhere on the brink between childhood and puberty, and there is nothing like a summer away from your parents to define just where you exist on that terrifying precipice. For the "cool" kids or, perhaps, the advanced ones, overnight camp was a fabulous journey to freedom and merriment. For those kids who were "uncool," or, maybe those that were simply scrawny and/or underdeveloped (that would be me), it was a totally different -- and sometimes hellish -- journey, but one that nonetheless was filled with unforgettable and valuable life lessons. 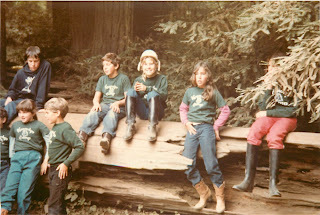 I went to Camp Kennolyn in the Santa Cruz, California, mountains for three summers in a row, 4th through 6th grades. Kennolyn was run by two old farts named Aunt Marion and Uncle Max, who were like no aunt or uncle I ever had. First of all, Aunt Marion's midsection was a perfectly round sphere, upon which sat her bobbly head, and underneath two shockingly skinny arms and two even skinnier legs. To top it all off, she was about 4-foot nothing, and therefore could easily be mistaken for a sour-faced garden gnome (including the beard). On the other hand, Uncle Max was about 6'2," and looked eerily like Mr Greenjeans from Captain Kangaroo. Both of them were as strict and unfriendly as the day is long, which is really odd considering their passion in life was to own a sleepaway camp for kids. One time Aunt Marion caught me chewing gum on camp premises (a definite no-no), and she dragged me by the ear to the dining hall, where she forced to stand on stage during dinner with the wad of Hubba Bubba on my nose. Fun stuff, epecially when you are 11 and overrun with insecurities. OK, back to camp. While Aunt Marion and Uncle Max were total nightmares, the counselors, on the other hand, were wonderful. Most of them were in their late teens, and bubbly and energetic. My first counselor, whose name was Rain (and whose middle name was -- what else? -- Beau), was SO energetic that she took to bringing male counselors from the boys camp into her bunk at night. I, unfortunately, had been assigned the bunk immediately OVER Rain's, as I had been the last of our troop to arrive to the cabin. I would lay there awake, eyes wide as saucers, listening to Rain and her consorts giggle and moan. It was awful for two reasons: 1) I seemed to be the only one in our cabin that heard it, probably because I was directly above the commotion, and 2) because I didn't fully understand what they were doing! Later that summer, when I was back safe at home, I must have still been processing because I crafted a bunk bed for my Barbie -- she and Ken would titter and wrestle on the bottom, while Barbie's younger sister, Skipper, would obediently lay on the top with a tiny pink pillow over her head. As far as my own extra-curricular camp activities, they were nowhere near as exciting. I was so uncoordinated at sports during this period of my life, that the activities I signed up for were nothing short of sedentary and, to be quite honest, nerdy. I enthusiastically participated in cooking, stained glass, arts and crafts, animal care (which basically meant feeding ducks and small rodents -- although one year things got REALLY exciting on the a.c. premises when someone accidentally stepped on a guinea pig), storytelling, and, of course, campfire cooking (slightly, though adequately, different, from the aforementioned basic "cooking"). The one vaguely physical activity I did at camp was Water Ballet. Can you imagine anything more ridiculous? To this day, whenever I venture into a body of water, I am still strangely compelled to perform my favorite aqua dance move, known simply as "The Sinking Leg." Once a week at Kennolyn we had to camp in the woods (which were actually part of the Sierras and were really, truly beautiful, although, of course, I didn't appreciate that at the time). This phenomenon was called Outpost. We would trek into the Redwoods, lay out our sleeping bags, and overdose on powdered hot chocolate mix eaten straight from the bag, which we would then follow with a delicious mug of hot Tang. Mmmm...I can still feel my gag reflex kicking in. One of the more bizarre traditions started at Outpost was the tradition of kissing a banana slug, so as to become a member of the highly esteemed Banana Slug Club. The weird thing about banana slugs is that they don't look like they should actually exist in the natural world: they are about 8-inches long and precisely the same shade as a ripe banana, hence the name. Why Mother Nature created something that so clearly does not blend in with the rest of its environment, I have no idea. Anyway, during one Outpost, our counselor was determined to have all her girls be members of this fantastic Banana Slug Club (although I don't particularly understand why it was so fantastic. I mean, where were the perks?). Anyway, she picked up an especially large one of these yellow slugs and held it right in front of our mouths. We puckered up and the counselor pushed that cold, slimy beast right onto our quivering prepubescent maws. Ick. But the funny thing is, I still feel a swell of pride when I think about it. Camp was, for me, rich with coming-of-age adventures and experiences. Of course, there was the time my best friend, Cortney, brought a cookie into our cabin, and when a hungry mouse came scurrying across our sleeping bags in the middle of the night, our piercing screams woke up not only the entire girls' camp, but the boys' camp, as well (we nearly got expelled). I also had my very first slow dance on the tennis courts at Kennolyn. I still remember it was to Thompson Twins' "Doctor Doctor," and was with a nice Canadian boy named Damian -- although the next day I decided his head was too close to the shape of an egg for things to progress further. Fun and terrible, sweet and scary, overnight camp was the first glimpse I had of real autonomy. And to have that total freedom again, as well as that unmitigated immersion in nature, is something I still long for daily. But, more than anything, I feel thankful and appreciative for these charming and bittersweet memories -- they will forever be a part of me, and so will Kennolyn. And so, unfortunately, will banana slugs.